British and American English: The Easter update | Notes from the U.K. The Methodist Church in our village has its annual egg roll at this time of year, and you need to understand that this is an event, not something to eat. If it was something to eat and if we were speaking British, it would be an egg on a roll. If we were speaking American, it would be a deep-fried appetizer from a Chinese restaurant—what the British call a spring roll. But no, this is more along the lines of the Gloucester Cheese Roll, only without insanely steep hill and the ambulances. And the cheese. It’s a bunch of kids rolling eggs down a hill. The one who reaches the bottom first (or at all, since chickens never designed their eggs for racing) wins. I’m not sure what the prize is. A deep-fried appetizer from a Chinese restaurant? An egg sandwich? A chocolate bunny? I’ve never gone to the event, but I was specifically invited the year A. was a judge. Unfortunately, I got sick and stayed home, and that left me free to imagine it any way I want. What I imagine is that Easter in Britain is about rolling an egg down a hill. 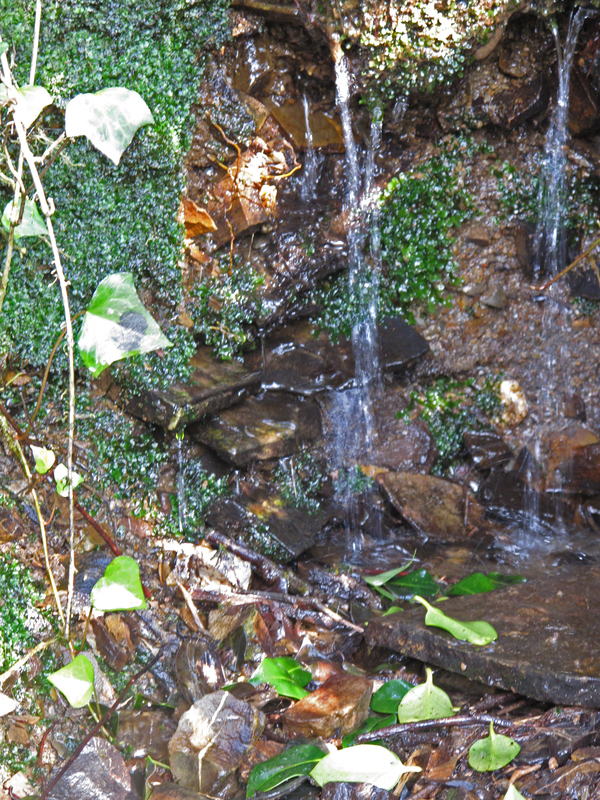 Irrelevant photo: A tiny waterfall. Looking at this, you can almost believe the legends of fairies and little people. In its more commercial form, Easter’s also about chocolate eggs, and these are massive things—not American football size, but moving in that direction. All your childhood dreams of greed, shaped like an egg. The Guardian (that’s a newspaper, in case you need to know) likes to compare the prices and qualities of different brands of food, and this year’s chocolate Easter egg comparison shows that some of them get into silly money territory. Hotel Chocolat? £27, and it’s filled with smaller chocolates.Harrods? £29.95. The paper recommends that one for Russian oligarchs, who aren’t known for their sense of humor so let’s assume the paper’s not making fun of them, and for safety’s sake neither am I. Marks & Spencer has one for £40 and that kind of money buys it its very own link. (FYI: Links here are not for sale unless I’m making fun of something at the other end, in which case no one’s likely to offer me money. I am so pure I’m almost invisible.) M & S’s egg is a “giant golden lattice egg with a delicate show-stopping small egg perched inside. . . . Because they’re so special, we’ve only made 7,500 eggs, each one numbered on the presentation box for an extra touch of luxury.” And then you eat the sucker and it’s gone, leaving you with nothing but that numbered presentation box and a bunch of adjectives. Spend enough money and you get a lot of adjectives. The original copy had even more, but I’m still an editor at heart and just had to cut some. And in case you’re worried, the gold is edible. Which is another adjective but an important one The Guardian doesn’t specifically recommend this particular egg for Russian oligarchs. I’m not sure why. Back in the land of the sane, you can find chocolate eggs in supermarkets for £5, or for £2.99. And we still haven’t gotten to chocolate bunnies. I’ve seen these in two sizes: nestle in your palm size and coffee mug size. I brought a small one home from a grocery shopping trip and Wild Thing reports that they’re good. In the U.S., you can’t make your way through a store in the weeks before Easter without tripping over egg-dying kits. Or—well, I assume that’s still true. It’s been a long time since I’ve been around, never mind at Easter. In Britain, though, making Easter eggs from actual eggs don’t seem to be a big thing. “We never celebrated Easter,” he said. I think that, in his quiet way he was scandalized. He was also, in my opinion, wrong. It’s true that we didn’t celebrate it in a religious way. But we dyed eggs every year, and found people to give them to (who may have wondered about them but were kind enough not to ask). My brother and I woke up to Easter baskets—jellybeans, a chocolate rabbit (in my memory, they were huge), a panorama egg with a sugar shell and little cut-out figures inside, small chocolate eggs in foil wrappers, all of them nestled in fake grass. Give a kid candy like that and she’ll think it’s a celebration. Add dyed eggs and, yes, you have a holiday. Sorry, Dad. It didn’t turn me religious, but it did leave me with a fondness for chocolate bunnies, even though I don’t eat them anymore. I worked in a candy factory when I was in my twenties, and it left me immune to candy’s lures. The one exception is good, and very plain, dark chocolate. But I do like to see chocolate bunnies in their gorgeous foil wrappers. I can even get sentimental about jellybeans. They never did taste good, but I ate them anyway. Like Everest, they were there. How could I not? So if you celebrate Easter, happy Easter. And if you don’t, I can still recommend the chocolate bunnies. They don’t care what you believe. This entry was posted in Intercultural Mayhem, Language, Traditions and tagged Americans in Britain, Americans in England, anglophile, Britain, British and American English, British English, Cornwall, Easter, humor, language, village life by Ellen Hawley. Bookmark the permalink. The one Easter I spent in the UK introduced me to Cadbury Creme Eggs. I don’t worry about other types anymore (except, maybe, Lindt, but that’s a whole other class of chocolate). I’ve only found Creme Eggs once here since. Which is probably a good thing. We did en Easter egg roll at our Methodist church here in the states when I was growing up. Maybe the Methodists just don’t want to take the time to hide all those eggs. I had a good time reading this post. Happy Easter (or not) but enjoy the chocolate. That’s the spirit of the season: chocolate. Ok need to chime in to prove that we Americans aren’t total barbarians: we have egg rolls in the US, too. There’s a pretty famous one that happens on the South Lawn of the White House each year, and they’re part of a lot of community Easter events, along with egg hunts, which mostly involve mad dashes of parents across grassy areas grabbing “hidden” plastic eggs full of candy while bewildered and not fully ambulatory toddlers look on, holding empty Easter baskets and sometimes crying (sometimes the parents cry, too). Anyway, regarding jelly beans–have you tried Jelly Bellies? They’re like crack cocaine. Great description of the egg hunts. I’ve seen photos, and they always seem to involve a crying toddler. I have tried jelly bellies, and they’re better, but really, that time working in a candy factory just killed candy for me. Note to self: I must find a job in a chocolate factory. ASAP! It does work, but I wouldn’t recommend investing years of your life in it the way I did. Do Americans not roll eggs then? Handy to know since I was planning on taking my kids to roll the eggs we decorated yesterday. It won’t stop me doing it but it will help me understand the states. My sister and I once rolled eggs down the side of a waterfall and scared the innards out of a German tourist walking below. I shall avoid doing that. Growing up in poverty, we rarely had chocolate eggs on easter but were told we could have any egg we wanted from Woolworths the following day when the prices had all been slashed. Maybe that’s why I’m hard-wired to be so thrifty. I get my kids a modest collection of mini eggs for easter as a seasonal treat but I don’t truck with all this easter basket malarkey. Some people appear to be throwing their kids a second christmas. I can justify my easter thriftiness on the basis that I’m an atheist but actually I don’t think I would conform to the excess even if we were properly celebrating Easter. Wild Thing reminds me that there’s an annual Easter Egg Roll at the White House. I never heard of it being done anywhere else. So it’s not unheard of in the U.S.,just uncommon. Very uncommon. I don’t think, in hindsight, that our Easter baskets were on a level with the Christmas excess, but to a small kid they seemed endless. Most of it, I suspect, was made up of jelly beans. Well if the President does it then so can I! I’ve been to the Egg Roll at the White House. You must be accompanied by a small child (and get an advance ticket) to get in. They really do have the kids roll eggs with spoons, but there are no steep hills on the lawn, so it’s not very easy. And the toddlers don’t really have a clue what they are supposed to be doing anyway. I think most of the fun is getting to let the kids run around on the White House lawn, which is off limits the rest of the time. And there’s costumed characters and occasional celebrities, that’s fun too. We got to listen to Amy Tan read to us about Sagwa. I had to google Sagwa to figure out what it was. Still not sure about the connection to Easter, but then what does a rabbit have to do with it either? I do like the idea of events where adults have to be accompanied by a child instead of the other way around. Yeah, that wax can be addictive. Wonderful post. I laughed so hard my morning coffee nearly came back up. That’s not exactly the effect I was hoping for, but it ain’t bad. Being paganish, buddhist-ish, mostly secular-ish gnostic Unitarians, we celebrate with hidden baskets of goodies, including much chocolate, and always a bunny. Sometimes we color eggs, but not every year. That’s it, though. So they roll colored eggs down a hill? For what purpose? I think I’ll research that. Surely there must have been fairies long ago…at least. With dragons and unicorns…at least. …and the one whose egg didn’t get stolen on the way downhill by the fairies and dragons go a glimpse of the unicorn. Wow. Spoken like a true Unitarian. This has GOT to be saved for posterity in a divinity student’s thesis. Do Unitarians have divinity schools? Your got me curious enough to google this and I found not only a list of them (which I’m including just in case you feel the need to apply) but a connection between Harvard and Unitarianism, which I was too impatient to read. Not many people will argue with that. Cadbury Easter Cream Eggs!!! Is there anything better? … rhetorical question because there isn’t. I’ve been exercising super-human willpower and I think I’m actually going to make it to Easter this year without eating one … or 500. … but the most interesting part was your declaration that working in a candy factory ended your love of sweets. You mean there is a possible cure out there for me?! Yes, but I’m not sure it was worth the almost 5 years I put into it. Working around candy, it gets fairly repulsive. My hair even smelled like chocolate. Desperate times calls for desperate measures! I remember once going to church on Easter Sunday with my family and feeling delightfully supported when the preacher said “I am not a fan of coconut filled chocolates, they are the devil’s candy!” My brother and I rejoiced an “Amen!” Though now I enjoy the devil’s candy as an adult. Boy, that’s some heavy-duty condemnation. I wonder if it was a theological position or if he just didn’t like the things. Me, I felt that way about licorice when I was a kid, although I never thought of bringing the devil into it. Ya, he just didn’t like the coconut, loved the sense of humor my preacher had. I’m relieved. I really did think this damning things to hell thing was getting out of hand. *His word, not mine. They weren’t hidden so much as unenthusiastically set down. Great image. He sounds like the kid to lock in the attic the day before Easter and not let out till sundown. Not that I’d advocate that, mind you.